October 23, 2014 – The National Center for Earth and Space Science Education (NCESSE), and the Arthur C. Clarke Institute for Space Education, in partnership with NanoRacks LLC, announce a new opportunity for school districts in the United States and internationally to participate in the tenth flight opportunity of the Student Spaceflight Experiments Program (SSEP). Launched in June 2010, SSEP was designed as a model U.S. National STEM (Science, Technology, Engineering, and Math) education program that immerses approximately 300 students across a community in every facet of authentic scientific research of their own design, using a highly captivating spaceflight opportunity on the International Space Station (ISS). The program is designed to inspire and engage the next generation of scientists and engineers. The SSEP Mission 8 to ISS will provide each participating community a real research mini-laboratory capable of supporting a single microgravity experiment and all launch services to fly the mini-lab to ISS in Fall 2015, and return it safely to Earth for scientific analysis. Mirroring how professional research is done, student teams submit research proposals and go through a formal proposal review process to select the flight experiment. The design competition – from program start, to experiment design, to submission of proposals by student teams – spans 9 weeks from February 23 to April 24, 2015. A curriculum and content resources for teachers and students supports foundational instruction on science conducted in a weightless environment and experiment design. Additional SSEP program elements leverage the experience to engage the entire community, embracing a Learning Community Model for STEM education. SSEP provides seamless integration across STEM disciplines through an authentic high visibility research experience. For school districts, or even individual schools, SSEP provides an opportunity to implement a systemic, high caliber STEM education program tailored to community need. More broadly, SSEP is about a commitment to student ownership in exploration, to science as a journey, and to the joys of learning. SSEP is open to U.S. schools and school districts serving grade 5 through 12 students, 2- and 4-year colleges and university, informal science education organizations, and internationally through the Center’s Arthur C. Clarke Institute for Space Education. SSEP is not designed for an individual class or a small number of students in a community. 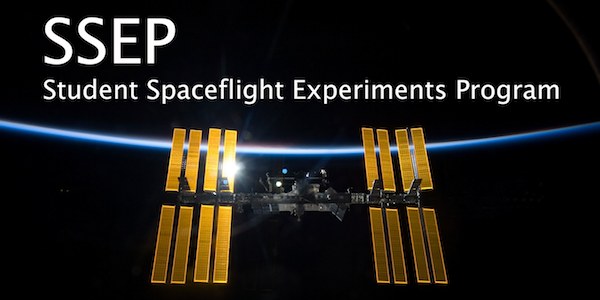 SSEP Mission 8 to ISS includes an experiment design competition February 23-April 24, 2015. Flight experiments are selected by May 28, 2015, for a ferry flight to ISS in Fall 2015. All communities interested in participating in Mission 8 are directed to inquire no later than November 15, 2014.